UN special envoy Kofi Annan said Friday he was "optimistic" that ministerial crisis talks on Syria's conflict being held tomorrow would produce an acceptable outcome. "I think we are going to have a good meeting tomorrow. 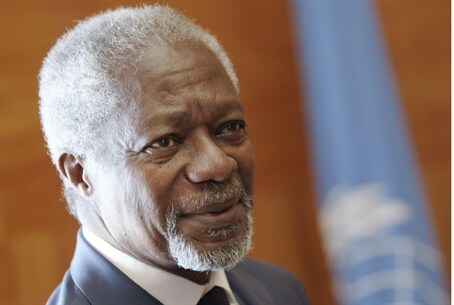 I am optimistic," Annan said in Geneva as he arrived for preparatory discussions today. The talks being held by foreign ministers of major powers and regional players in the Swiss city will end "with an acceptable result," he said. Russia proposed changes yesterday to Annan's plan for a national unity government in Syria, despite initially supporting it. However, the United States, Britain and France rejected the amendments. The suggested changes relate to Moscow's refusal to support the ouster of Syrian president Bashar al-Assad, diplomats in New York said, on condition of anonymity. Annan's spokesman Ahmad Fawzi said Friday, "The talks are on course and the preparatory meeting is going ahead this morning." Western and Arab diplomats said that the preparatory meeting of senior officials would be key to paving the way to consensus on achieving a political transition in Syria. But Assad on Thursday dismissed the notion of any outside solution to the 16-month-old popular uprising against his rule. "We will not accept any non-Syrian, non-national model, whether it comes from big countries or friendly countries. No one knows how to solve Syria's problems as well as we do," Assad said. Assad has justified a protracted bloody crackdown on dissidents and rebels saying his government is fighting its own "war on terror." Meanwhile, a series of high-profile successes has led the fighters of the Free Syrian Army to step up their attacks on Assad's government. In recent weeks they have gone so far as to initiate clashes in Assad's bastion of central Damascus. The FSA is comprised of some 30,000 Syrian Army Defectors led by dissident Syrian officers who have taken refuge in neighboring Turkey. UN officials say at least 10,000 people – most of them civilians – have been killed since unrest erupted in Syria in March 2011. Diplomats, however, say the number is likely much higher.